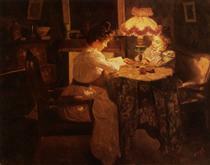 Edouard Léon Cortès (1882–1969) was a French post-impressionist artist of French and Spanish ancestry. 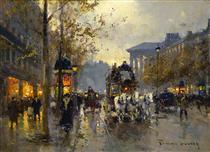 He is known as "Le Poete Parisien de la Peinture" or "the Parisian Poet of Painting" because of his diverse Paris cityscapes in a variety of weather and night settings. 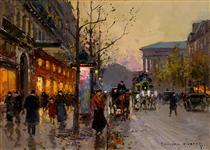 Cortes was born on August 6, 1882, in Lagny-sur-Marne, about twenty miles east of Paris. His father, Antonio Cortés, had been a painter for the Spanish Royal Court. In 1914 Cortès married Fernande Joyeuse, with whom he had a daughter in 1916. Although Cortès was a pacifist, when war came close to his native village he was compelled to enlist in a French Infantry Regiment at the age of 32. As a contact agent Cortès was wounded by a bayonet, evacuated to a military hospital, and awarded the Croix de Guerre. After recovery he was the reassigned to use his artistic talent to sketch enemy positions. Later in life his convictions led him to refuse the Légion d'Honneur from the French Government. In 1919 he was demobilized. His wife had died in 1918 and he soon married his sister-in-law Lucienne Joyeuse. Cortès lived a simple life amid a close circle of friends. He died on November 28, 1969, in Lagny, and has a street named in his honor. 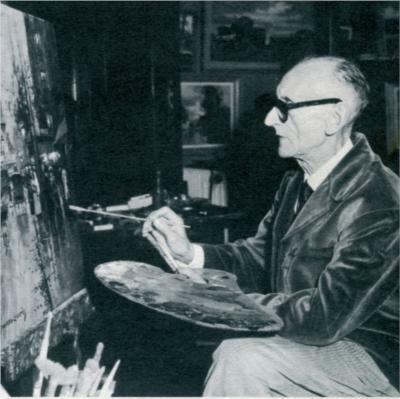 His works were first exhibited in North America in 1945 and he subsequently achieved even greater success. 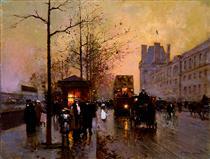 In his last year of life he was awarded the prestigious Prix Antoine-Quinson from the Salon de Vincennes. On November 30, 2000, four paintings by Cortès were recovered in Kalispell, Montana, following an eight-month investigation conducted by the FBI's San Francisco Division. The recovered paintings were stolen in 1988 during a burglary at the Simic Gallery in Carmel, California. In 2008, a lost Cortès painting of a Paris street scene was discovered amongst donated items at a Goodwill Industries thrift store in Easton, Maryland. After an alert store manager noticed that it was a signed original, the painting was subsequently auctioned for $40,600 (US) at Sotheby's. 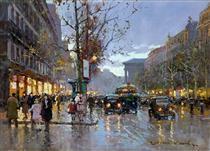 Avenue De L'Opera Edouard Cortes ? 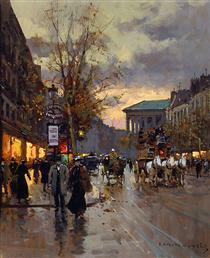 Boulevard de la Madeleine Edouard Cortes ? 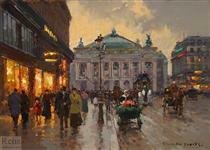 Flower Market At La Madeleine Edouard Cortes ? Place de la Madeleine Edouard Cortes ? 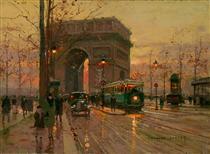 Triumphal Arch Edouard Cortes ? Booksellers along the Seine Edouard Cortes ? 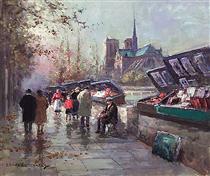 Booksellers along the Seine, Notre-Dame View Edouard Cortes ? 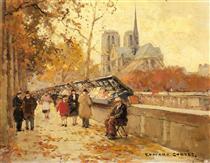 Booksellers of Notre-Dame Edouard Cortes ? 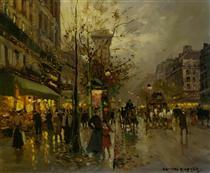 Boulevard a Paris Edouard Cortes ? 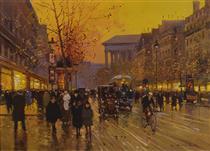 Boulevard Bonne Nouvelle, Porte St. Denis Edouard Cortes ? 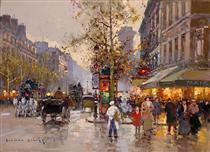 Boulevard Bonne-Nouvelle, Paris Edouard Cortes ?